Marking its origin in the Second World War, Jeep has spread throughout the world since then. The first Jeeps were made for American military by the Willys MB. The civilian models were in 1945. Jeep was the first four-wheel drive mass-production SUVs. Even the luxury brand Land Rover starting making their cars based on Jeep. The jeeps have been made by many automobile manufacturers around the world and in India, they are being made since the 1960s under a licensing agreement by Mahindra. The craze of Jeep spread rapidly this past decade and in 2016 the company decided to enter solo with their Wrangler and Grand Cherokee models. After that, the brand introduced Compass on 12 April 2017 in India, which rocked the SUV market of India. Jeep compass was introduced for the consumers seeking affordable and comfortable SUV with the JEEP logo on it. Jeep Compass is the first crossover SUV of the company. The first model of the compass was introduced in 2007 with a 158 HP 2.0 liters or 172 HP 2.4 liters four-cylinder engine. The car had a CVT or five-speed manual transmission. The Jeep expected females to be the buyers. Compass gained a fresh look in 2011 with slight off-road improvements. The beefed up front end design reminds of the Grand Cherokee. Many adjustments and improvements were made in the new model to make it more off-road capable of one-inch height increase, fog lights, underbody skid plates and 17-inch alloy wheels with all-terrain tires. The latest generation Jeep Compass was revealed in September 2016 in Brazil and made its debut at the Los Angeles Auto Show in November. It is available in 4 variants mainly Longitude, Limited, Sport, and Trailhawk. 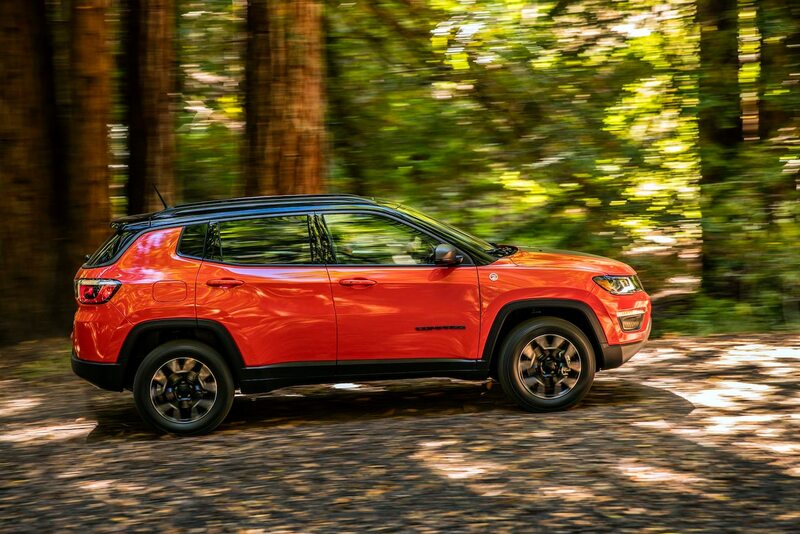 Trailhawk is available only in four-wheel drive whereas others have the option of either front wheel drive or 4-wheel drive. In India jeep is made at Fiat’s facility in Ranjangaon, Maharashtra. UConnect 4C 8.4 and 8.4N touch-screen infotainment system provides connectivity, entertainment, navigation and communication features that are easy to use and powerful as well. Beats Premium Audio System with a 506-watt digital amplifier delivers a very decent quality sound with lashings of bass which is iconic of beats. 18-inch aluminum alloy wheels for better stability. Forward Collision Warning- monitors the car ahead and automatically pulls brakes it gets too close. The Jeep Compass is available in India with a 1.4-liter turbocharged petrol and a 2.0-liter diesel engine churning 160PS/250Nm and 170PS/350Nm respectively. Both these engines come together with a 6-speed manual transmission. For petrol variant, there is an option of automatic transmission. Since its launch India, Jeep Compass has become quite popular in the market and hailing customers from its competitors. With Compass, Jeep has succeeded in securing customer base even in the mid-range consumer market.